In order to optimise their market survey and to carry out an optimal mix marketing, The communication the marketing direct agency IB Conseil takes care of the textual content of a questionnaire. Creation of the website questionnaire which is the landing page of the mailing. The company IB Conseil (communication and marketing direct agency) has define the contents. Imaginform has developped the application : the website and the back office to follow in reel time the answers. 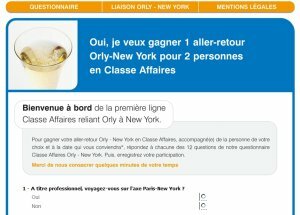 This website is associated by an oline game (http://www.orly-newyork.com). This operation has allowed ELYSAIR to optimise its survey and look forward to the opening of new low fare lines. Further more 3400 subscribers have been contacted on the occasion of the effective launching of www.lavion.com, the website saling low fare tickets (1000 first tickets A/R à 1000€). Bilan: 360 sold in 7 days . At the same time, creation advertising animated banners to publish on specialised websites. To launch this new airline, LAVION, the company Elysair, the communication agency IB Conseil et Imaginform have set up the e-mailing campaign associated to a specific website. As a result, the compagnie have optained 3500 contacts opt'in.